Digging Deep was honored to present out game, Shadow’s Edge, at the European Games for Health conference. Here are some of the conference highlights. This past week, Digging Deep had the chance to present our game Shadow’s Edge at the fast-growing European Games for Health conference in the Netherlands. With 60 speakers from both the health sector and the technology and gaming sector, it was an opportunity to see what’s new and next in the way we apply gaming to health challenges. Right away, one of the things that struck me is how far games have come in being seen as a legitimate tool in supporting people with illness. This was true to the point that the conference organizer, Games for Health, had been able to work with Dutch insurance companies to make it possible for patients to be reimbursed for games that work as medication, as long as they are prescribed by a doctor. 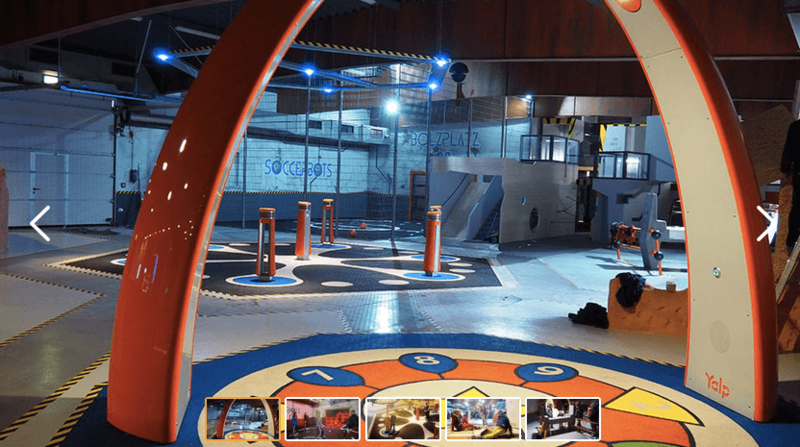 : a VR game by the company JamZone that helps you understand and regulate your stress levels as you move through an imaginary world, cross bridges, climb mountains, etc. During gameplay, the system uses biofeedback to help players learn to control the patterns of stress in their own minds. Like Shadow’s Edge, the game is based on solid psychological principles, in this case, StressJam chooses not to minimize stressful situations, but to help people learn to deal with stress in healthy ways. : Yalp offers interactive, outdoor play equipment meant for the design of inclusive playgrounds. I loved this because so often playgrounds are only usable by able-bodied kids. Yalp’s playground modules include sound structures, full-size memory boards and other digitally interactive activities that allow all children, at schools, hospitals, or other organizations, to play games ranging from musical chairs to board games to soccer. 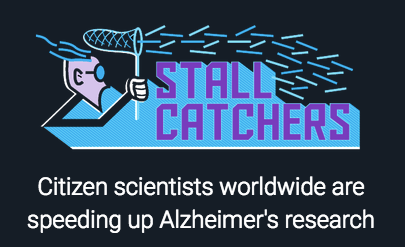 : This online game enlists citizen scientists to help catch Alzheimer’s disease earlier, when there may be more that doctors and patients can do to slow the progression of the disease. Research from Cornell University links clogged blood vessels in the brain — called “stalls” — to the development of Alzheimer’s. The game recruits players to watch and analyze videos of mouse brains, trying to find “stalls.” The idea is that many people, working together can do a job that would take a single researcher weeks. And it’s fun! The results of this game could lead to a new treatment for Alzheimer’s. Of course, we were honored for the opportunity to present our free game, Shadow’s Edge, at the conference as well. Like these other games, Shadow’s Edge works with a specific problem, namely the lack of resources that help teens and young adults learn to manage the emotional side of chronic or serious illness. Basically, our medical system tends to focus so much on physical wellbeing that emotional wellbeing can be overlooked. Shadow’s Edge guides players in their quest to bring color back to a city that has been devastated by a storm. Through their journey, players find a community of support while building resilience. For us, and for the gaming community as a whole, it seems as if health applications are the next great frontier. We know games can waste time; could they also give time back to people with health conditions? Events like the European Games for Health conference are starting to ask and even answer some of these important questions. Shadow’s Edge is 100% free to download and play at the App Store and Google Play.